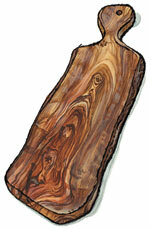 Olive Wood Board for sale. Buy online at Zingerman's Mail Order. Gourmet Gifts. Food Gifts. A simple slice of tree, polished and rustic. Elegant and rustic all at once. There’s something about olive wood that makes it feel that way. This board is particularly exquisite. Cut diagonally from an olive tree trunk, the grains are exaggerated, the shape is amorphous, the bark is left on much of the edge. The overall shape is like a paddle with a handle. Each is different. It makes a gorgeous serving platter for salami or cheese. Mix up a pitcher of cocktails, and set out this handsome board with some choice snacks for a relaxing evening.